Experience, Professionalism, Integrity, and an Excellent Track Record . . .
Those are the words our clients use to describe us. 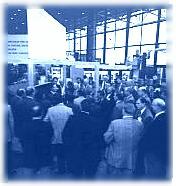 We provide all services related to managing and promoting expositions - from selling exhibit space to on-site operations. Maintaining close working relationships with convention facilities in major cities throughout the U.S., we have successfully managed first-time, as well as established expositions from 20,000 to 800,000 square feet. We take pride in providing our clients with the highest level of service. © 2018 Kenworthy Management, Inc. All Rights Reserved.